Whitney Phillips, president of Mad River Rocket, rides one of his sleds at Lincoln Gap, in Warren, Vt. THE snow was so deep one morning in Vermont last month that Lincoln Gap was barely recognizable as a road. The mountain pass, the gateway to sun-dappled Long Trail hikes in warmer months, was buried beneath white powder. Schools were open, but Scott Joslin, a faculty member at the nearby Green Mountain Valley School in Waitsfield, Vt., decided to go sledding anyway. “This looks pretty sick,” Mr. Joslin shouted from atop a 15-foot cliff off the road. Watching his friend and wading through hip-deep snow was Whitney Phillips, president of Mad River Rocket, a sled company based in Warren, Vt. A few minutes before, Mr. Phillips had shuttled three of us, clad in ski gear and goggles and clutching the latest models of Mad River Rockets, up here on a neon-green Arctic Cat snowmobile. Sledding, that quintessential snow-day sport, typically involves dodging obstacles. After a few runs on a tame slope packed with other sledders, it’s time to stow the Flexible Flyer and down a steaming mug of Ovaltine. But in the growing sport of free-sledding, steep, forested mountains are preferable to bald, wide hills. Trees are good. Cliffs, rocks, ledges and jumps — for spins, flips and big air — are better. Best of all is untouched snow to cushion landings and create feathery roostertails behind the sledders. Thanks to a legion of hard-core fans who are spreading the free-sledding gospel through online videos, Mad River Rocket, whose sleds have landed in some 300 stores nationwide, plans to open its own 250-acre park next winter. Deep in the Green Mountains, though, I was just wondering how Mr. Joslin planned to land his jump. He shouted — “Three! Two! One!” — and, arms waving cartoonishly, disappeared into a cloud of snow before emerging with a giant grin. Uh-oh. My turn. After five years of tinkering, Mr. Sellers and friends unveiled the Mad River Rocket in 1987. The tiny plastic boat has a monorail keel for steering and stability, gunwales on the bow to deflect snow and a quick-release strap to secure rider to sled. While there are other sleds geared to grown-ups, like the Hammerhead Sled (made by CherryMax Sleds in Ferrisburgh, Vt.), Mr. Phillips claims that only the Mad River Rocket allows true free-sledding. His company’s slogan is “Get on Your Knees.” Instead of stretching out face-first or sitting with the feet in front, free-sledders kneel on ribbed cushions, leaving their arms free to help turn the 47-inch-long, six-pound sled, to stop and to throw tricks. On Lincoln Gap, Mr. Phillips handed me a Killer B model, one of the hundreds of variations that Mad River Rocket has tried over the years. After a few short slides on the snowy road, we plunged into the woods. It felt like surfing, smooth and curvy, as we drifted through the snow; we were fast, and then we were slow as we hit deeper stuff. Sledding, once a too-short run that ended in a clumsy tumble at the bottom, took on a new grace and rhythm as we snaked down the mountain. Mr. Phillips paused to show me how to edge the sled, as in skiing, and how to sit back. We darted around snow-covered logs, spilled over tiny frozen falls and ducked beneath sugar lines strung among the maples. A conga line of snowstorms had smothered New England, and we weren’t the first ones carving up slopes on Mad River Rockets. Allie Rood, 19, of Warren had already snowshoed up 2,750 feet on Mount Ellen in Sugarbush in November, before the ski area opened for the season, and free-sledded to the bottom. “I was just floating through the snow,” Ms. Rood said of the day, considered a “first descent” by Mr. Sellers. Mr. Sellers said that in collecting peaks, a long-standing Rocket tradition was to pop a bottle of Champagne at the summit, eat some sandwiches and then race to the bottom in groups of 20 to 30 people. “We set free the mountains of Vermont,” he said. For nearly as long as Mr. Sellers has been freeing other mountains, he has also owned a large swath on Prickly Mountain, near Sugarbush. Prickly Mountain is the future site of the Mad River Rocket Sled Park. When Mr. Sellers recently learned that foresters planned to cull some of the trees on the mountain, he and Mr. Phillips decided it would be the perfect time to create a backcountry sledding area, complete with natural halfpipes, sled-friendly glades and a rope tow. A flurry of free-sledding videos, showing long swooshes through Utah powder, launches off backyard jumps and sleds bumping down stairs (set to Kenny Loggins’s “Danger Zone”), has hit YouTube and other Internet sites. 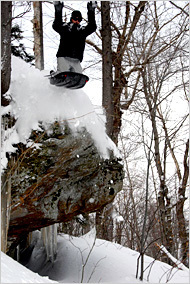 This winter, Mad River Rocket is calling for more videos and photos on its Web site (www.madriverrocket.com). I pushed myself forward and — wham! — smacked right into a beech. But the sled’s bow took the brunt of the crash. Though Mr. Sellers said he knew of no serious accidents on Mad River Rockets, he said it’s only a matter of time before sledders “messing around” get hurt. For some, the cost of free-sledding — $99 for the Killer B — may also be a deterrent. Darlene Murphy is another Vermonter who goes extreme sledding down steep mountains with friends, but on homemade sleds. “We don’t want to use those commercial things,” she said. But Mr. Phillips’s snowmobile and planned rope tow aside, free-sledding upholds the original vision of an earth-friendly alternative to skiing. Mad River Rocket shells are made in Ohio from recycled plastic. “They require no parking lots, no sewer systems, no condos, no footprints,” he said. Well, maybe a footprint, or a sinewy sled print, until the next snowstorm comes along.